Besides the recap scenes, the worst thing about a Sproat script is that his dialogue is functional rather than decorative. Somebody answers the door, and says, “Oh, hello there. What a surprise to see you this early!” And the other character says, “Yes, I hope you don’t mind me showing up at this hour.” And the first character says, “Not at all, not at all. Please, come in.” And the second character says, “Thank you.” And then they walk all the way into the middle of the drawing room to begin the actual scene. That kind of thing is the equivalent of Hamburger Helper — just extra junk that fills up the space where there should be a screenplay. A good writer knows that if you absolutely have to have a door-opening sequence, then you give the characters an emotion to express, or something funny to say, or you have it happen just off screen while another character is doing something interesting in the foreground. You don’t just waste twenty seconds on dialogue helper. This is seriously not a difficult thing for a screenwriter to learn. Another problem with purely functional dialogue is that everybody ends up sounding the same, with a default rhythm and vocabulary that overrides a character’s individual personality. Everyone has the same feelings, expressed in the same words. So today, just to make me even more ready for his exit, Ron Sproat has constructed an entire episode out of filler dialogue. I swear, there’s not a single interesting line in the show. David! Maggie? Where’s Amy? Amy? David, I heard you talking to her. You couldn’t have. She isn’t even in here. I think you’re lying, David. I heard her voice. Amy, where are you? Here, Maggie. We’re going to a place in the west wing. Well, why does Quentin want us to go there? You’ll find out when we get there. How do we get there? Well, we have to go through the west wing. There’s something peculiar about those children. Peculiar? Yes. I know! What do you know? I know where we are! Where are we? We’re in my room. Your room? Yes. It’ll be all my fault. Your fault? Yes. It’s part of our game. Game? Yes. You’re supposed to be in bed! But it’s not that late. Yes, it is. Well, it’s getting late. I’d better — It’s not that late! Come into the drawing room, and have a drink. Well… Please do. Oh, it’s late. I’d better go on. I’ll take off. All right. Good night, Chris. Good night. I’ll make sure that Mrs. Johnson’s downstairs, and then I’ll take you to your room. And you go to sleep, David! Okay, Maggie. Good night! Good night. I was saying good night to David. Is Amy here? Amy? Yes. She’s not in her room, and I thought she might be in here with David. Oh. No, she’s not here. Where do you suppose she is? What are you doing here? I came to see David. You know you’re not supposed to be here. Yes, I know. But I like Carolyn. I don’t want to play the game with her. We have to do what Quentin tells us to do. Always? Yes. Always. You children play very odd games. What’s so odd about dress-up? Didn’t you ever play it when you were a little girl? Sometimes. I had an idea today. I’ve been meaning to suggest it to you all evening. Sometimes I get scared to like people, because I’m afraid. I’m afraid that they’ll go away and leave me, or die. Oh, I won’t leave you, Amy. Of course you won’t, David, and neither will I, Amy. I’m ashamed of myself. Why? Because I got scared, and only babies get scared. That’s not true. Even grownups get frightened. That’s what I told her. What is it? Music. Can’t you hear it? No. Light your candle. All right. Where are we going? You’ll see. What does Quentin want us to do? You’ll see. Why does Quentin want us to go there? You’ll find out when we get there. Why does Quentin want us to come here? I don’t know yet. David! The music! I can hear it! I can hear it too, Amy! Thanks, Maggie! Don’t thank me, just behave yourselves from now on. I promise we will! All right. I’m frightened of the children. Frightened how? I don’t know how to say it. I can’t put my finger on it, but somehow they’ve changed. David is changing. He’s not the way he used to be. Change? It sounds natural to me. He’s probably just growing up. Quentin, you shouldn’t have come here. Why not? Because I’m afraid of them. I’m afraid of both of them. I’m going to tell her, David. No, don’t. Tell me what, Amy? I’m ashamed to tell. Well, don’t tell her, not if you don’t want to. I do, because I don’t want to get you in trouble. Amy, what are you talking about? You don’t believe in her powers. You don’t believe in her curse. But you should! I’ll find a way of stopping her. I don’t know if you can stop her! I don’t know if anyone can. Don’t worry. I’m tired of their interfering. I’m going to put it to an end. Something’s going to happen to Mrs. Johnson. What? You’ll see. Is something wrong? No. Why do you say that? Well, it’s just the way you look at me sometimes. I just wonder. What do you mean? Shall I be honest with you? Of course. What are those strange clothes you’re wearing? We found them. Where? In the trunk in the attic. That doesn’t make any difference to me. Doesn’t it? Of course not. David, I feel funny. How? I don’t know, I just don’t feel the same as I did downstairs. What are you talking about? What are you doing here? Is something wrong? Did they explain? Can’t you hear it? Shall I be honest with you? Are we going to be punished? Tell me what? Why did you lie to me? Do we have to? Do you know who I found downstairs? When would be convenient? What kind of a dream? What are you children doing down here? Don’t you understand? Who are you? What’s that? What did he do? What do you know? What do you mean? What do you say? Why do you say that? There’s another cryptic info-drop about the Quentin/Beth backstory today, which shows that the writers really have not figured out where that’s going. In the scene, David and Amy are speaking as Quentin and Beth, and it is a very “interceding with Oscar” type exchange. Also note the mention of “they”, the dark and shadowy organization manipulating events from behind the scenes. Amy: Quentin, you shouldn’t have come here. Amy: Because I’m afraid of them. I’m afraid of both of them. David: Don’t be afraid. They can’t do anything to us. Amy: But he hates you so, and so does she! David: No more than I hate her. Amy: You don’t believe in her powers. You don’t believe in her curse. But you should! David: I’ll find a way of stopping her. Amy: I don’t know if you can stop her! I don’t know if anyone can. David: Don’t worry. I’m tired of their interfering. I’m going to put it to an end. So, first problem: It doesn’t match up at all with what we see in 1897, except for the word “curse”, and the suggestion that infidelity might be involved. Using deliberately unheralded pronouns means that the audience is supposed to be vaguely puzzled by this, and we’re not expected to remember it later in any detail. It’s basically the verbal equivalent of a trilling violin on the soundtrack; it indicates tension. And then there’s the tone. It’s partly the suffocating Sproatness of it all, but these lines don’t sound like Quentin as we know him. It’s not the kind of thing that Quentin would be concerned about, and it’s definitely not the way that he talks. Most obviously, they haven’t figured out that Quentin is funny, which is the second most important thing about him. This isn’t Quentin yet. 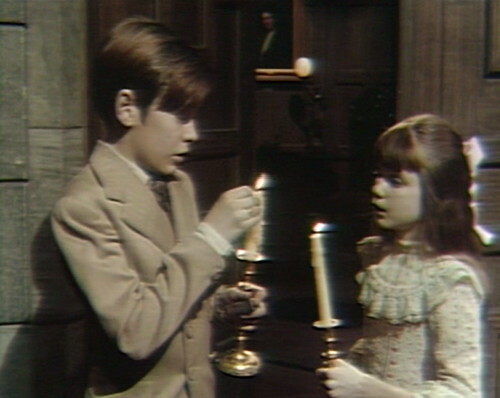 David and Amy are in the drawing room with candles, and they hear Carolyn in the foyer. David blows out his own candle, and then blows out Amy’s, but hers is already out. The two kids grin as they go on with the scene. 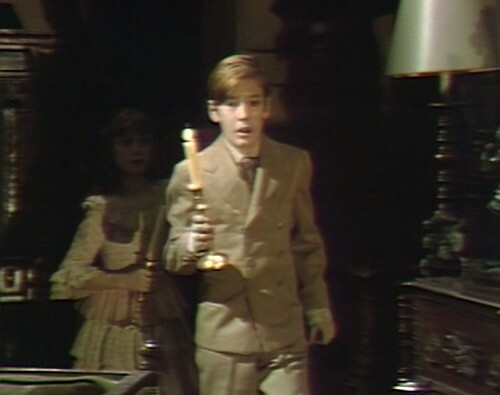 After Chris leaves and Carolyn goes upstairs, the kids leave the drawing room. 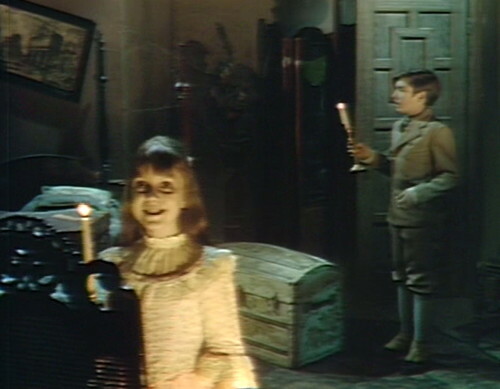 David relights their candles, but his blows out before he exits the scene. He puts his hand up as if he’s protecting the flame anyway. David and Amy make a big deal about going into the abandoned west wing — but apparently, Mrs. Johnson hears them as she’s going to bed. They’re not even talking very loud. Where does Mrs. Johnson sleep, exactly? If that’s supposed to be Beth’s room, I wonder if they’ve decided she was a servant. It still conflicts with the fancy clothing Amy wears as Beth (and that Terry Crawford will continue to wear when she appears as Beth’s ghost). But yeah, Quentin doesn’t sound like Quentin yet. It’s interesting because once David Selby opens his mouth in Episode 701, he’s Quentin. A cult show loses its way…..and we feel bad for the show. And this ep served Amory well. Validation, see? It’s an emergency for Sam, and Sam will emerge soon. This kind of thing would happen a lot when I would tell somebody new about the show, and then we got this, and they’d say, “huh?”, and…. It was some kind of Syndrome. Somebody should give it a name. It happened too often. I actually felt a little sick when it did. Yes. All I want out of life is an avant-garde comments section. Maybe at this point they were thinking Beth was a servant/lower class who was elevated in status by Quentin, possibly by marriage? Remember when Barnabas told Beth she had an aristocratic look? Possibly a hint that they weren’t thinking of her as a servant, until they figured out that making her a servant worked better. Quentin is still in his angry ghost phase, so he’s not going to have a sense of humor. I always thought they intended it as a great irony, when we finally meet the living Quentin, and find out how brilliantly hilarious he is. 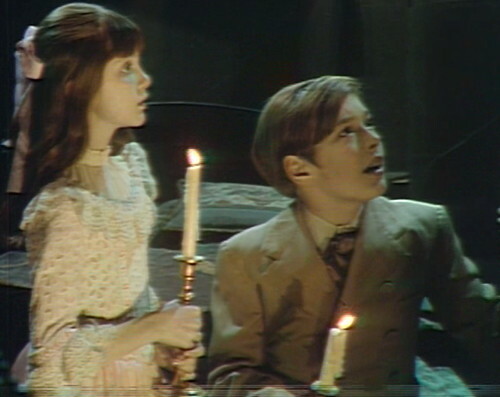 The female ghost in Turn of the Screw is the children’s previous governess. I think that’s the original intention for Beth. She’s a staff member, and beneath Quentin’s station, but she wears nicer clothes and eats with the family. It’s possible that they made her a lady’s maid because they were doing Jane Eyre, and they wanted the governess to be another Josette clone. I would have liked to have seen Terry in more positive roles where she might turn out to be the victor. Her roles were Beth and Edith, both unhappy women. I, too, like the Sproat era of the show, but then I’m speaking as one who also thinks very highly of the 1966 era, which many others find slow and boring. Perhaps without his restraint the show would have been like a roller coaster gone out of control, just too fast and overly intense, too much in the way of thrills and too little in the way of examination of feelings and reactions and perspective. Regarding his writing approach with the dialogue where questions are asked but not really answered, and the outcome only vaguely hinted at. He seems to have been greatly influenced by Samuel Beckett; in particular, the play Waiting for Godot comes to mind while reviewing the dialogue in this post, which would have been at the height of its popularity while Ron was just a Sproatling at the Yale School of Drama. Personally I used to think Sproat scripts were a breath of fresh air during the Marmostein days. I don’t mind Malcolm Marmorstein myself. He was responsible for the Phoenix storyline, so he had a hand in helping to save the show as well when it needed saving. He also co-wrote a clever teleplay for Rod Serling’s Night Gallery (“The Flip-Side of Satan”, from season 2 and starring Arte Johnson). Yeah, I admit I don’t really understand the 66’ers, who are children of God, presumably, and entitled to live their lives as they please. Why? Isn’t “waiting for Godot” about two people talking while waiting for someone to show up that never does? It has Ron Sproat all over it. Actually I loved both vampires and werewolves DS AND “Edge of Night”, which eventually moved to ABC and the DS time slot. They were both soap operas with a twist and were both unique. I love 1966 Dark Shadows because I love the characters and enjoy watching them on screen, even if they’re not really doing anything. For me it’s that simple. I often skip the early days, but start with episode 123. 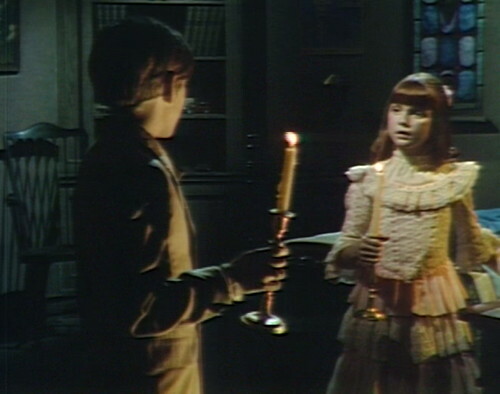 That’s when Laura first appears, and Dark Shadows becomes fascinating, for the first time. This was when black and white really served it well. David Ford and Kathryn Leigh Scott do some of their best work here, as Sam Evans starts to unravel the moment he sees Laura, who is damn creepy. Frank and Vicky’s ultra-spooky late night road trip to the land of crickets and kookaburras to meet the world’s most decrepit groundskeeper is both wonderful, and strange. His first words are “You’re alive?”, because that’s not what he’s used to, lately. In 1897, Laura is very funny, but in ’66, she a scary, cold thing. We never get to understand her the way we do with Barnabas, or Angelique. She never gets too humanized, she remains a mystery, and there’s a certain power in that. And I loved Dr Guthrie, the way he goes after Laura, he was super-cool. What I love about ’66 Laura is she isn’t always a scary, cold thing. When she’s with David she’s very warm and loving. I know Diana Millay has said that she played the role as a loving mother and David was the most important thing in her life, and I do think this comes across in her scenes with him. 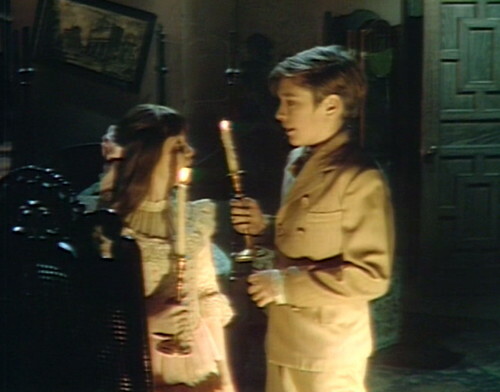 And the scene where she first tells him the story of the phoenix is one of the best acted moments in Dark Shadows ever – just a spectacular performance. But then, she can turn cold an icy in a heartbeat as soon as you say or do something that gets in her way. Wasn’t Ron Sproat also the only person connected with Dark Shadows to appear at the first Dark Shadows Fan Convention? While other DS people were still in their “I Am Not Spock” / “If You Ask Me About the Beatles, I’m Leaving” periods, Sproat was already embracing his involvement with the show. This is totally unrelated to anything DS, but Danny Horn, if you are anything like your picture, you are one hot dude! Are you single? Attached? Just curious. You are certainly high on the hotness scale, much like Joel Crothers. Thanks for doing this blog. Congrats on having a husband! Maybe the next slow day for DS (one in which you don’t have too much to say), you could throw in some gratuitous shirtless beefcake pictures of some of the original DS actors (or at least links to the pics) and maybe, because you are the great DS blogmeister, you could throw in a gratuitous shirtless beefcake pic of yourself (if your husband does not mind too much). All the best! Oh, if you could remember what fanzine that was, I’d love to see it. It’s hard to find interviews with the writers. 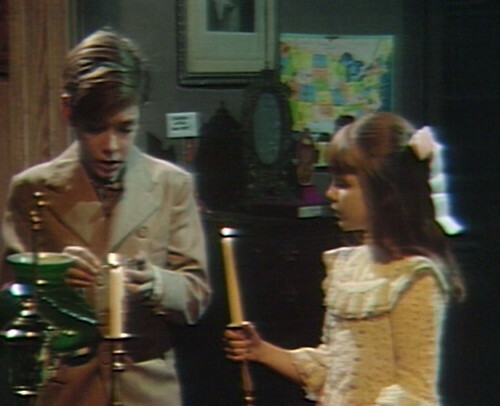 I’ve just watched this episode, and it struck me that it establishes that the caretaker’s cottage is quite a long walk from Collinwood, though in one episode when Laura was living there Vicki brought some tea over to her from the big house. There’s absolutely no reason why the writers would have remembered this, but I’m greatly amused by the idea of Vicki trekking miles up hill and down dale with a fully laden tea tray. The Ron Sproat debate is interesting. I see it both ways. I understand Danny’s impatience with and dislike of his writing. I also sympathize with those who say they like the slow pace of his scripts. I wouldn’t say I’m a fan of Sproat scripts particularly, but I will say that I watch DS–and when I was a kid watched other soaps with my mom–for multiple reasons. One reason, and yes, the most important reason, is to experience a story, and with DS, it’s also to experience the supernatural. That’s where Sam Hall excels. At the same time, however, I also watch DS (and did watch other soaps) just to be in this particular place with these people, separate from anything in particular happening in the way of a story. I just like to be at Collinwood and in Collinsport, and when I watched “As the World Turns” with my mom, I just liked being at the Hughes’s house (more so than the Lowells’ house). This is kind of like real life. Now, don’t get me wrong–I eventually came to tear my hair out over the glacial pace and repetition of the Jason McGuire marrying Elizabeth storyline, and even the Maggie trapped in Barnabas’s basement storyline. And Sproat’s repetition of lines asked as questions by another character, and all the “Really?” lines, as Danny has reproduced here, can drive me nuts. And certainly it would be nice to have some more aesthetically pleasing and playful language at times from Sproat. But as a traditional soap writer–creating a place and people that I want to hang out at/with–not to mention giving us a breather from the manic happenings from time to time–he can do a pretty good job.